Here are the two telescopes in place. This view is from the door looking north. I have already made a temporary pier adapter for attaching the equatorial mount to the concrete pier. 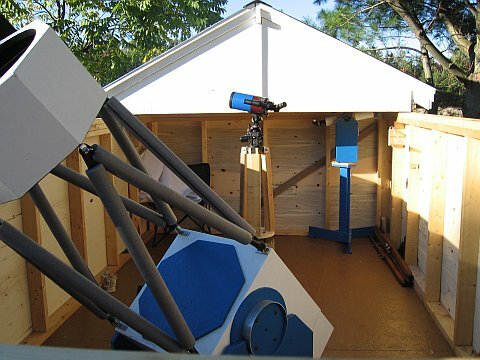 The height of the telescope had to be such that it can be swung sideways to be low enough so the roof will clear the telescope as it is rolled off. 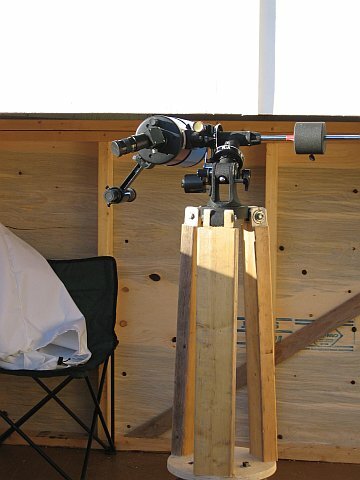 The Dobsonian is already low and could be raised about 8" to better see over the 4 ft walls. 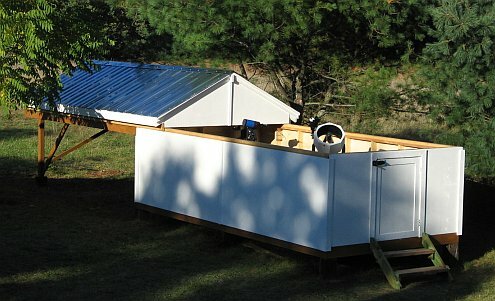 An equatorial drive platform could be added. Here the Maksutov is rotated for clearance by the roof for rolling back over the observatory. The white in the background is the end of the roof. This photo also shows the temporary pier-to-tripodhead adapter in more detail. I hope to replace this with a sturdier and more functional adapter. Plans: Power is needed in the observatory to power lights, the clock drive and a computer (laptop). It will be low voltage, probably 12 VDC. If power is brought in, then a data line will be run through the same conduit to provide connection to a computer in the nearby building.